We have three new webstore items for CCA! They are all commissioned stickers by artists who graciously gave their time and talent to make custom artwork for an artist-series collection. This new sticker is out of this world! 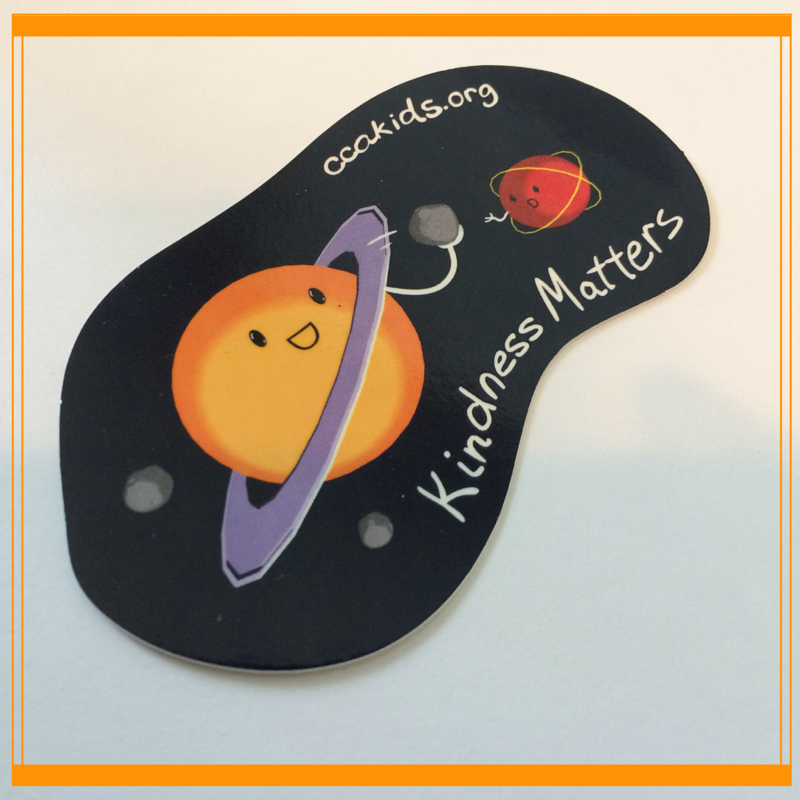 The "Kindness Matters" sticker, by Dana Wilson, reminds you to look out for the little guys around you. Dana designed our 2015 Choose Kind Day video and we asked her if she'd come back and design again for CCA. Check out our exclusive interview below to learn more about her work and how she chose to create such a cool piece for CCA Kids. DW: I’m from a tiny little suburb of Chicago, and after spending some time in Los Angeles for school and work, I decided I liked Chicago too much and came home. DW: I remember always being into art, all the way back to using construction paper and markers and playing around with Play-Doh in our basement. Even during the times of my life when I turned my focus to other pursuits, I always kept little sketchbooks and notepads and doodled in the margins of school notes. I guess everyone does that, but not too many people are crazy enough to turn it into a career. CCA: When did you start using a computer to create art? DW: The first things I remember doing with a computer were playing games and using Microsoft Paint after watching my older brother draw a rose. This was the early 90s, and I like to pretend I’ve gotten a little better since then. I started working in 3D around 2001 because I wanted to make 3D games - only later did I decide to focus on animation. DW: I started college in computer engineering and it… wasn’t for me. When considering whether I should stick it out or make a change, I had to answer that same question - is animation a career, or would I rather it stay a hobby? As chaotic a career as it can be, transferring to study animation is one of the best decisions I’ve ever made. From the start, it’s been the amazing friends and mentors I’ve met who have kept me going in that chaos. DW: Even in 2D art, I use 3D software as much as I can, wherever it offers a shortcut. So for these cartoony stickers, I created most of the characters’ bodies in 3D and added features like their eyes and arms by simply drawing over the models. Since my focus has never been traditional drawing, I feel this process gives me a cleaner result much more quickly. DW: I wish I had a more specific answer here. My tastes are all over the place, and it seems like every day I discover new artists who create unbelievable work. I suppose that’s the magic of the internet - nothing limits how much we can find and fall in love with. DW: (https://vimeo.com/66608356) The piece of work I’m happiest with is my master’s thesis film, Why Are There Robots? It’s both completely absurd and entirely honest and personal. Of all the work I’ve done, Why Are There Robots? is the most transparent window into my soul - what makes me me. And it’s okay if it doesn’t really make sense to anybody else. DW: There’s inspiration all over my life - there has to be! From the story to the music to the medium itself, videogames have always inspired me. Movies and TV inspire me - they don’t have to be and most often aren’t animated. My daily life, my friends, my family, and the crazy thoughts that happen when I’m alone inspire me. DW: Kindness often is something you don’t have to think about doing. Others my see your actions as acts of kindness, but you just see them as right or normal things to do. DW: I’ve always held the idea of “simple yet effective” styles and work close, and a professor taught me to (almost) always say yes. If I had to pick one thing I live by, it’s that I am awesome! By that I mean that I know who I am, I have a very positive attitude about that person, and I trust that I’m always going to make the very best decisions for myself. DW: I got involved during the 2015 Kind Day campaign when I agreed to make an animated promotional video. A relative was looking for volunteer opportunities for herself, saw the word “animation”, and immediately thought of me. Of course it turned out to be a great cause, then the stars aligned, and I had enough time between projects to offer my talents to CCA. DW: Live five lives. If not that, live one life as cool as five.